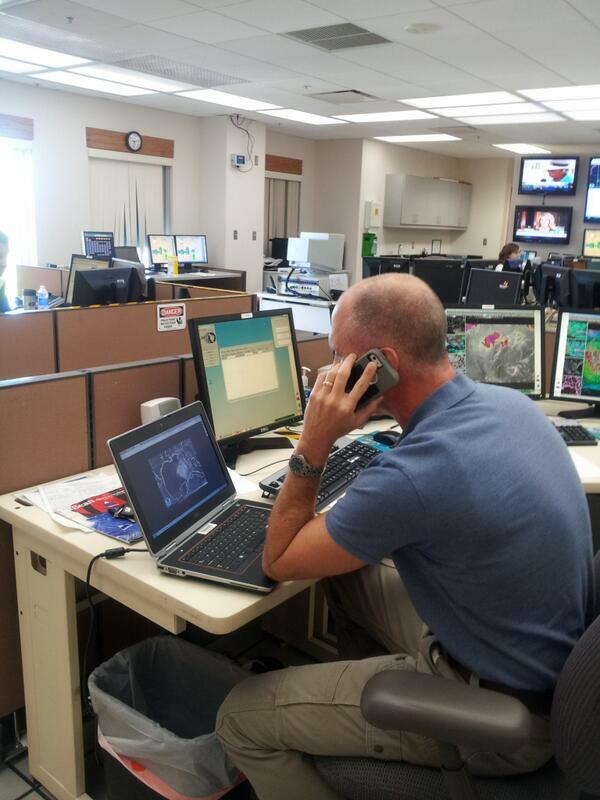 October 4, 2013 - Staff work in FEMA's National Response Coordination Center in Washington, D.C. in response to Tropical Storm Karen. Finish reviewing your family’s emergency plan (include your kids, too). Plan for scenarios such as how you’d stay in touch during a storm, where you could meet up in the event of an emergency, and who your out of town contact is, should communications become difficult in the impacted areas. A Red Cross "ready to go" preparedness kit showing the bag and it's contents. Red Cross photograph. Stay up-to-date with the latest forecast in your area by monitoring local radio and TV reports. It’s also important to note that local officials may send out Wireless Emergency Alerts to provide brief, critical instructions to warn about imminent threats like severe weather. If you receive an alert like the one below, please follow the instructions in the message. During all phases of a storm, continue to listen and follow the instructions of local officials. If Tropical Storm Karen brings significant rainfall to your area, follow local safety instructions and stay away from flooded roads – remember, Turn Around Don’t Drown. Follow ongoing updates from trusted emergency management accounts on social media, visit our Social Hub on your mobile device and computer. Download the FEMA app. It’s packed with tips on how to stay safe before, during, and after a tropical storm. You can also use it to track what’s in your family’s emergency supply kit, as well as store your family’s emergency meeting locations. Today, FEMA activated the National Response Coordination Center in Washington, D.C., a multi-agency coordination center that provides overall coordination of the federal response to natural disasters and emergencies, to support state requests for assistance from Gulf Coast and Southern states. Regional response coordination centers in Atlanta, Ga. and Denton, Texas are also activated. FEMA has begun to recall currently-furloughed employees necessary to serve functions of the agency that protect life and property as they prepare for potential landfall of Tropical Storm Karen, and for severe weather in the central U.S. based on applicable legal requirements and consistent with its contingency plan. FEMA Regional Administrators for Regions IV and VI have been in touch with emergency management partners in Alabama, Florida, Louisiana and Mississippi. FEMA has recalled and deployed liaisons to emergency operations centers in each of these states to coordinate with local officials, should support be requested, or needed. Today, three FEMA Incident Management Assistance Teams (IMAT), recalled from furlough, are deploying to the potentially impacted areas to assist with the coordination of planning and response operations. We’ll continue to provide updates as needed.